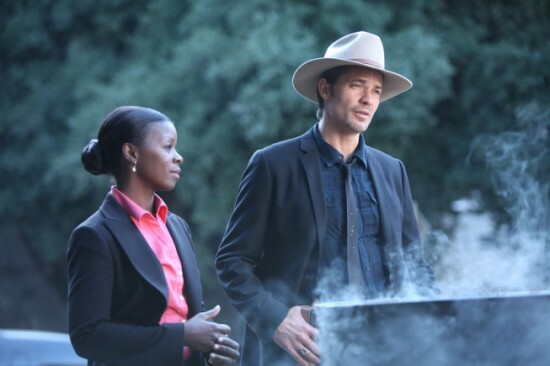 Episode Review: JUSTIFIED, "The Devil You Know"
Justified continued the search for the Bennett fortune in an episode that delved deeper into the motivations of some of the new characters and gave us some more information about some of the established ones. When it was all said and done, "The Devil You Know" was another solid episode from the show. This season's MacGuffin, Mags' money, continued to drive most of the plot because the prison guard who helped out Boyd and the nurse who patched him up are also looking at getting their hands on the fortune. After being threatened by the guard during last week's episode, Dickie Bennett ended up playing ball and was busted out of prison so he could lead Ash Murphy (the guard) and Lance (the nurse) to the loot. Since Dickie was a fugitive on the run, it was up to Raylan and Rachel to bring him back to justice, and their trail led them to Noble's Holler and to an interesting conversation with Limehouse. Plans to get the money for Ash and Lance fell through after Raylan got involved, so Dickie decided to keep it all to himself, but he was shocked to find that the millions had turned into a couple of thousands. Instead of taking what was left, Dickie decided to let it stay with Limehouse which continued their arrangement. Elsewhere, Devil still wasn't convinced that Boyd had any plans to make the crew money, and his loyalties were tested after he had a sit-down meeting with Robert Quarles. During their conversation, Quarles promised that he could make Devil a lot of money if he headed up the outfit down in Harlan. Devil's interest was piqued, and he even tried to convince Johnny Crowder to turn on his cousin so they could jump into bed with Quarles. Of course Boyd was a step ahead of Devil and was able to avoid the coup, but he also knew that Devil needed to pay for his betrayal, so he shot him. Now, I have to admit that some of the plot devices that the show's been using this season have not worked for me up to this point. For example, Mags' money has only been an excuse to give Boyd something to go after while also introducing new characters like Limehouse and Ash, so it was kind of fitting that it ended up being a few thousand dollars instead of a fortune. Hopefully, now that the money has done it's job we can move past it and focus on the tenuous relationships that it has created because that's when the real fireworks show will begin. Honestly, what I liked the most about "The Devil You Know" had nothing to do with the money and everything to do with Boyd. It seemed natural that Devil would eventually turn on him, and how Boyd dealt with what unfolded was mesmerizing. Once again, my only complaint with this storyline, and the show in general, was Quarles. I know that there are a lot of people out there who are praising the character and Neal McDonough's performance, but he's still too hammy for my tastes. The scene between him and Devil where he wanted an "amen" was comically excessive, and I couldn't take him seriously after that. Maybe he'll be toned down in future episodes, but I seriously doubt it because this is apparently his thing. I like the chemistry between Raylan and Rachel. While I don't see them ever exploring a romance (that'd be too unrealistic at this point in the show's run), I can see a solid partnership forming. It was nice having Loretta back, and her brief scene was proof that she was better on Justified than she is on Last Man Standing. This is going to sound insensitive, but I hope they kill of Dewey Crowe because he's outlived his usefulness. Boyd: "But, we're going to have to put a pin in this for now as I'm sensing a disturbance in the Force." After watching "The Devil You Know," it seems like the table's finally been set, and the next couple of episodes will finally start taking the audience to where this season's been pointing towards this entire time. All of the major players have been identified, we have the foundation set, so now let's get this thing rolling.